nGen Colorfabb is a product designed with a AM3300 Amphora polymer, nGen has been specifically developed for its colour and its unique composition has allowed it to develop a remarkable opacity while maintaining high brightness, giving your creations intense colour and a noble appearance. The Eastman Amphora ™ AM3300 3D polymer is a styrene-free material with low odour during printing, nGen is perfect for fans of 3D printing. Specifically, nGen is particularly suited to those who need flexibility to print within a wide temperature range. Indeed nGen filaments have been designed to print at a temperature between 195 and 220°C. nGen filament is subject to warping or peeling, if you do not have a heating plate, you are advised to use adhesive spray. For the heating plate we recommend a temperature between 75 and 85°C. Makershop3D offers a wide colour palette for nGen ColorFabb in order to meet all your expectations. The Amphora AM3300 compound in the nGen filament has good flow properties through the printer nozzle, and this even at temperatures well below some other polymers. These properties allow the AM3300 to produce prints in a wider range while producing reliable results, therefore causing less waste. 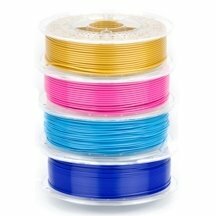 Discover all the nGen Colorfabb in diameters of 1.75mm and 2.85mm with many colours available to buy. Makershop3D recommends nGen filament for users wanting to print in different temperature ranges while retaining excellent resistance after printing. nGen filaments will adapt perfectly to FDM 3D printers using non-proprietary filament, as is the case, for example, for brands like Ultimaker, Tobeca or Leapfrog. nGen filaments are sold in 750g spools under 2 different sizes in order to adapt to all types of machine. If you have any questions about ColorFabb nGen filaments please contact our support team for more information.